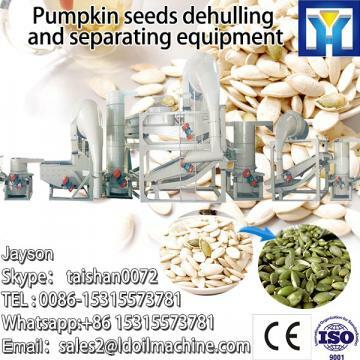 High efficiency sunflower seeds deshelling machine rack, fans, rotors, single-phase motor, the screen (size two), into the hopper, vibrating screen, triangular belt and its drive belt and other components. After the normal operation of the machine, the raw material is dosed quantitatively, uniformly and continuously into the feed hopper, and the raw material shell is crushed under the repeated blow, friction and collision of the raw material of the rotor. Seed and broken raw shell under the rotating wind pressure of the rotor and blow through a certain aperture of the screen, then the raw shell, grain by the rotating fan blowing force, light weight of the raw shell is blown out of the body, the seeds through Vibrating screen screening to achieve the purpose of cleaning.